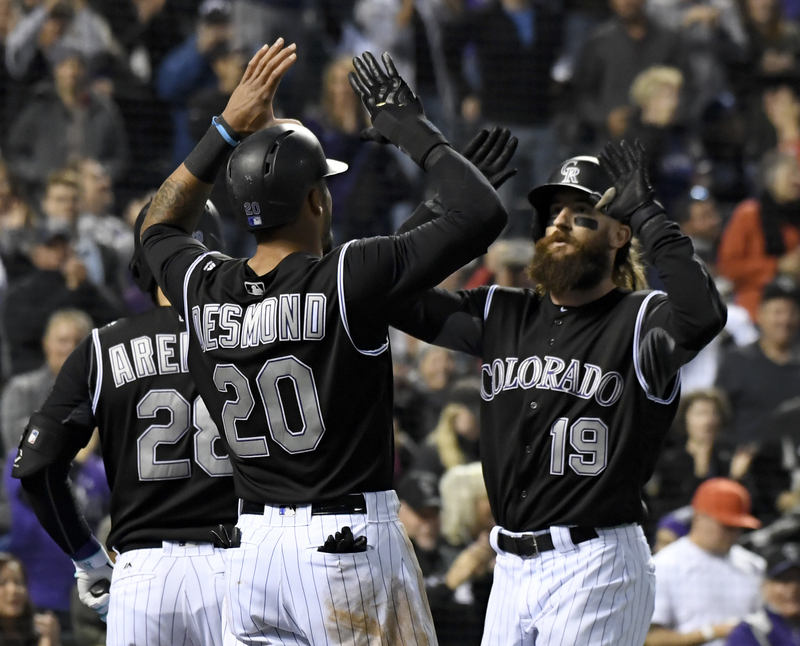 With a 9-1 win and four home runs on Friday night, the Rockies came one game closer to the second Wild Card spot. Unfortunately they couldn’t clinch as the Brewers won their game against the Cardinals, so it will be at least one more game for the Rockies chance to clinch. The scoring started early for the Rockies with Nolan Arenado clubbing a two out homer to center. Following that, Trevor Story singled and Reynolds drove him in with a two run homer to right center, giving the Rockies an early 3-0 lead. In the second inning, the Rockies got another two-run homer from Charlie, giving them a 5-0 lead and plenty of run support for Bettis who rebounded nicely after his recent struggles. Bettis would allow only one run in the game, a single by Justin Turner drove it in, but he induced a lot of mishit ground balls and did extremely well for the Rockies. He went seven innings while walking only one and allowing four hits, with three of those coming in the third inning. It was Bettis’ best start since his return from the DL and a hopeful sign of things to come for Bettis if he pitches in the post season. The Rockies got another home run and more runs in the fourth and fifth innings to pile on to their lead. Trevor Story hit a two-run homer, one of three hits on the day for him, and Charlie Blackmon drove in a run on a single for his third RBI of the game. It was really a great game for the Rockies and hopefully gives them some momentum on Saturday to give them the clinching win. Currently, the Brewers are up on the Cardinals so it seems as though the Rockies will need to win themselves. They take on Kershaw with German Marquez countering him in what will be a tough game to win for Colorado.